After failed attempts to become mainstream during both the early and the late 20th century, it appears that electric vehicles (EVs) are finally on the path toward becoming the future of transportation. With the support of both governments and industries around the globe, no one will be killing the electric car this time around. There’s no denying that the internal combustion engine (ICE) is firmly on the path toward handing over the mantle to EVs. But as inevitable as that transition is, its timeline is much less certain. Right now, less than half of 1 percent of cars and trucks in the U.S. are EVs. More concerning, of the 17.5 million new vehicles sold last year, only 116,548 of them were EVs — not even a quarter of 1 percent of new vehicles sales. 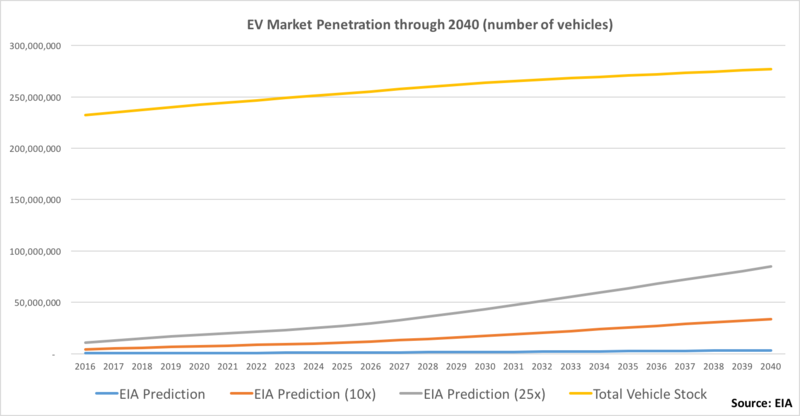 And according to projections from the Energy Information Administration (EIA), EV market penetration won’t hit 2 percent by 2040. Even if you assume that they’ve underestimated their numbers by a factor of 10 (unlikely), or 25 (very unlikely), we only see market penetration of 12 percent (33.9 million vehicles) and 31 percent (84.8 million vehicles), respectively. Heck, the U.S. won’t even reach a million EVs for quite some time. The Obama administration initially wanted that number by the end of 2015. And since sales have fallen woefully short of the goal, officials have been scrambling to revise it and still stay optimistic. This week, U.S. Energy Secretary Ernest Moniz said the country won’t reach 1 million EVs sold until 2020. Which itself relies on steadily increasing EV sales for the next five years. The way EV adoption consistently falls short of expectations is a big problem — for the EV industry, its advocates, and… well, all of us, really. Because, unfortunately, the damage oil is doing to our health and the planet isn’t something we can afford to wait on. Every year we delay, 58,000 more people in the U.S. die from vehicle emissions. Every year we delay, vehicles in the U.S. alone emit 1,801 metric tons — or 3.9 trillion pounds — of CO2 equivalent into our atmosphere. Every year we delay, oil continues to fuel conflicts around the globe and fund regimes that oppress tens of millions of women. Which begs the question, what can we do now to begin ending our oil addiction while electric cars scale up? Luckily, the answer is already on the road, no new vehicles required. Enter flex-fuel vehicles (FFVs). FFVs are capable of running high blends of ethanol (like as E85), as well as gasoline, and there are already more than 19 million of them on the road. As a fuel, ethanol burns cleaner than gasoline, driving down toxic pollutants and GHG emissions coming from vehicles. What’s more, ethanol can be made here in the U.S. from a variety of feedstocks ranging from biomass, to natural gas, to industrial waste. Obviously, ethanol can’t do it all alone either. We need to continue encouraging people to purchase EVs and other alternative fuel vehicles (AFVs) while expanding their fueling infrastructure in order to accelerate adoption rates. But at the same time, it’s naïve to assume that EVs or some magic bullet AFV are going to come to our rescue anytime in the next two (and potentially three or four) decades. The numbers simply don’t add up in time, and we don’t have the luxury of waiting.